When power fails, whether it be scheduled or not, the transfer switch is the key to transferring to stand-by power and keeping you functioning as normal. The ASCO Series 300 was designed to automatically transfer critical loads in the event of a power outage. It is also designed to handle total system loads including motors and other high inrush and inductive loads. The ASCO Series 300 assure the user of many years of reliability through its rugged construction and proven performance. 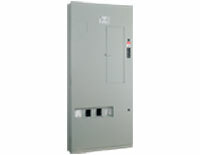 The Series 300 is listed to UL 1008 standard for Transfer Switch Equipment and CSA standard C22.2 for automatic transfer switches. Compact sizes rated 30 through 3000 amps in a compact design. Available to 600 VAC, single or three phase. Easy-to-read flush-mounted control and display panel provides LED indicators for switch position and source availability. It also includes test and time-delay bypass switches as standard features. Standard engine exerciser for weekly automatic testing of engine generator set with or without load. Supplied with solid neutral termination. Optional switched neutral pole available. Accessory kits available for field upgrades. With space in electrical closets being at a premium, the use of wall or floor-mounted ASCO Power Transfer Switches assures designers optimum utilization of space. 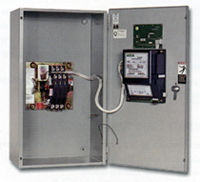 All transfer switches through 2000 amps are designed to be completely front- accessible. This permits the enclosures to be installed flush to the wall and still allows installation of all power cabling and connections from the front of the switch. 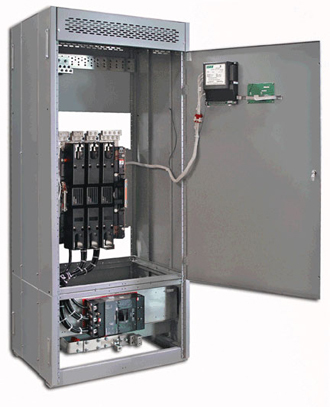 Cable entrance plates are also standard on the 1600 and 2000 amp units to install optional side-mounted pull boxes for additional cable bending space. Adjustable time-delay feature prevents switch from being activated due to momentary utility power outages and generator dips.